I teased a working unit of a bench power that I built last year. I’d always intended to build a second unit for a friend, and I finally did that. I cataloged the process in the best way I could figure, and here’s that post! 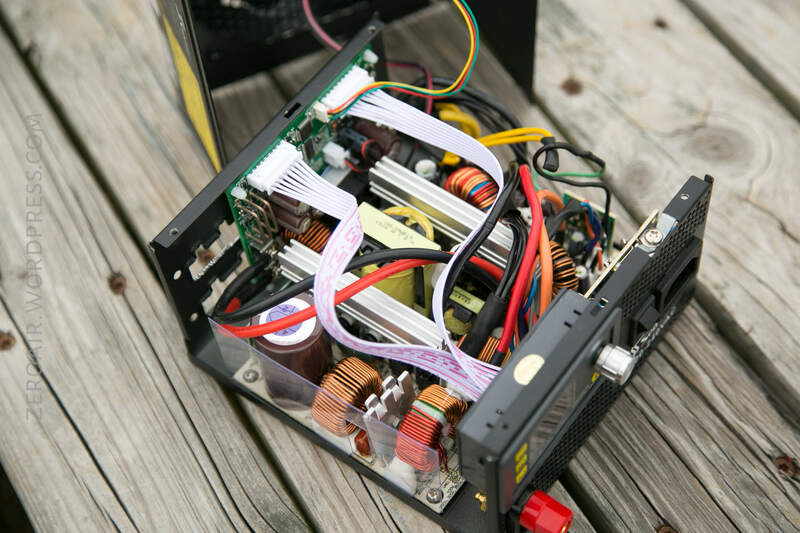 So here’s my latest (and only second) “How Do I…” Build a Bench Power from a PSU. This isn’t a review, it’s just how I build this thing. And I’m not an electrical engineer or have any background in engineering or electronics. Everything I learned and used in this post, I read from internet sources. They probably know more and could help you more than I can. But I’m happy to pass this knowledge along, and I hope you find it useful. Furthermore, there are many other ways to build this unit, and most of them are easier than this way. I chose this way specifically because I wanted to have a bench power that wasn’t much (if any) larger than the computer PSU that I was using. In the end, how you build it will be up to your needs. And finally, let’s get this out of the way: This won’t be the cheapest way to obtain a bench power. I started off thinking the cost would probably be along the lines of a similar unit but at this point I can’t really say that it is. What I can say is that I learned grossly more doing this than I would have if I’d just bought a unit, and that knowledge is worth vastly more than the difference in cost. I am not an electrical engineer. You should assume that all of the parts used in this build intend to kill you, and treat them with respect. Treat this as a learning experience – there are other off-the-shelf bench powers that are as (or more) capable, and likely less costly. Build this at your own risk! $22.72 ATX Power supply. I used this Seasonic M12II-620 full modular unit. $48.99 RuiDeng Constant Voltage Current Converter. I used the RuiDeng DPS5020. $1.75 (5) Binding posts. I use these. $3.55 DANIU Electrical Cutting Plier Wire Cable Cutter Side Snips Flush Pliers Tool. (Yes I’m putting these in the “must have” category). Total of the above: $85.95. You can already see that an off-the-shelf unit will be less expensive. 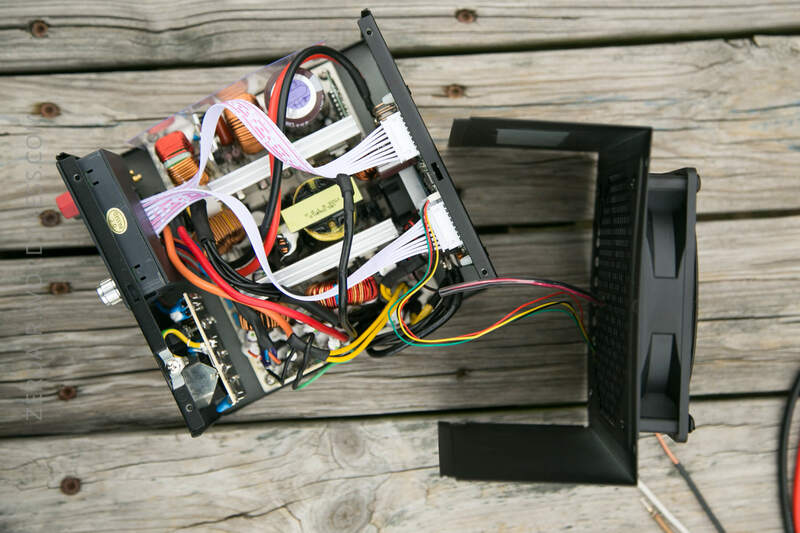 There’s a chance you’ll have some of this in your electronics drawer, but you’ll certainly have to buy at least some of the parts. You may read on to understand my decisions to continue the project, even at this cost. $4.66 (1m) 12 Gauge Silicone coated wire. I used this. 14 Gauge would probably be ok; that’s really up to you. $4.99 4mm Gold Bullet Connector Banana Plug. You’ll want at least a few of this type, but there are tons of other options. There’s a strong chance you’ll find yourself in need of something more than the above, but this list should cover most of what you need. I could not be happier to have a bench power. I’ve found it ridiculously useful in my flashlight testing, and just with stuff around the house. Second to that, I learned so much when researching this (and building two), and that’s been worth at least the cost, and realistically much more. The downside of this particular build is that my max voltage available is around 11V. For most of the flashlight stuff I do, this is fine (thought there are some 12V emitters becoming more common now). Ideally a supply for flashlight needs would be a minimum of 15V (and the next step past 12V input is probably 24V input). 24V input would be perfect. Maxing out the RuiDeng unit would be even better, I suppose…. Here’s basically what we’re building. It’s an ATX computer power supply, to which I’ve added a set of banana plugs attached to a RuiDeng 5020 adjustable current adjustable voltage power supply. And this is useful in a ton of ways. I connect leads to the red and black banana jack at bottom left there, and I can supply anything with up to ~11V at ~20A or so. And any variation below those numbers. The only change I had to make that really affected the size, was to move the 120mm fan from the inside of the case, to the same screw holes but on the outside of the case. Not that big a deal, and ultimately it provides a nice place to grip the unit for transport. The input power on this device does not change. It accepts wall power, so 110V. 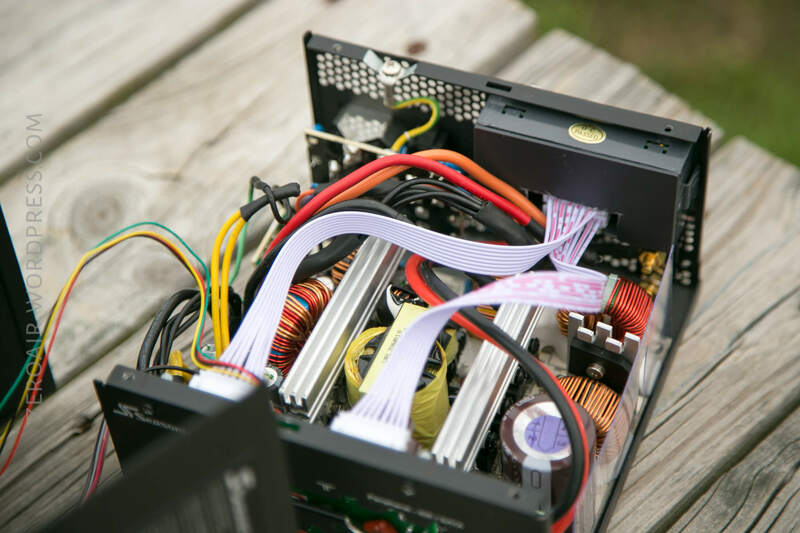 That part of the ATX power supply is exactly the same as if using it for your computer. The more interesting part of this build is the power that we can get out of the device. That image is from Makezine. 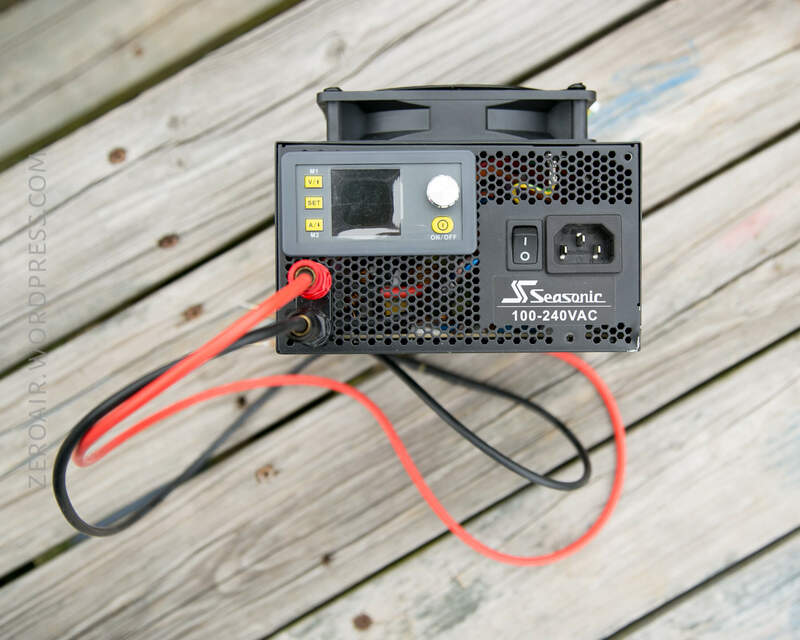 What we’re interested in specifically is the 12V rail. In my original design, I used 5V and 3.3V too, but I haven’t found those useful in real life. I’ll tell you later how to use those if you think you’ll need those voltages. 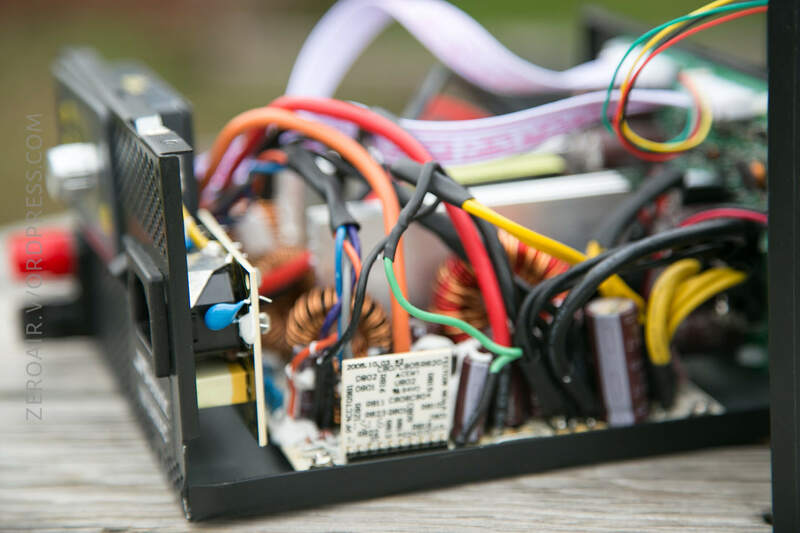 With this limitation of our ATX power supply, and using the DPS5020, we know that we will never get more than 12V output. And it’s really 12V – losses due to inefficiencies. I am ok with this, and for my flashlight and related hobbies, this has served me extremely well. 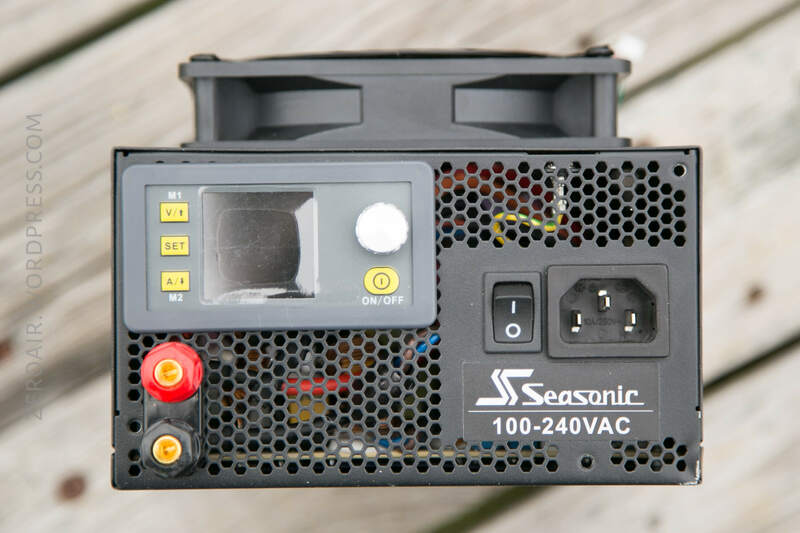 Some might ask could we connect the 12V rail and the -12V rail to get a total of 24V. Yes, you could. The problem with this is that the negative rail are usually rated for very low current (in my case, I believe 0.5A), and if you use the 12/-12, your max current will be the lesser of the two. So setting the system up this way was not for me. I made a bunch of build timelapse videos, too. Not sure how helpful they’ll be for anyone. I’ll try to give a bit of a rundown of each video, just below the video! I’m just breaking the PSU open here, and taking some preliminary parts off. Note that yellow sticker. 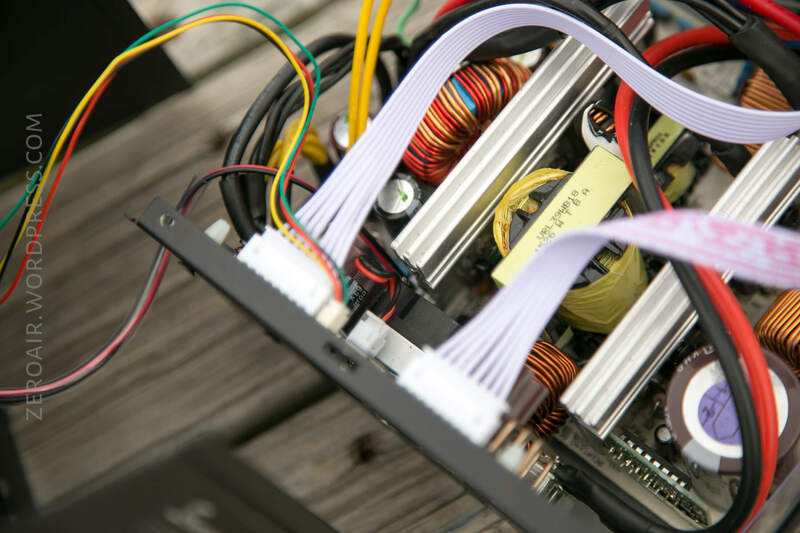 You’ll want to have a good look at the PSU you use, to see what power can be obtained from all the different voltages. In my case, there are two 12V rails, each capable of 24A. (In truth these are likely not independent rails, but since I can’t use over 20A anyway, this isn’t a problem. It really just means that this PSU is more capable than I actually need. It was free, so that’s fine.) When you disassemble, you’ll have to disconnect the fan. 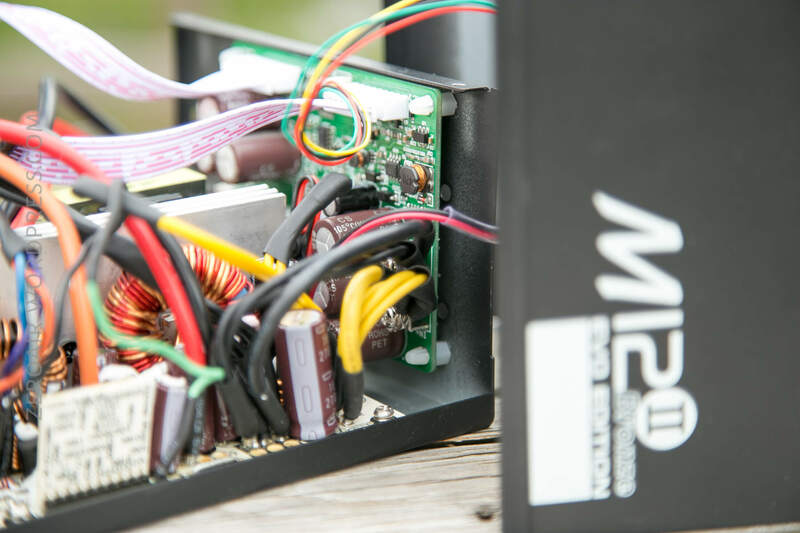 This is a fully modular power supply, which means there are no loose wires coming out like with many of the older power supplies. This actually works out fantastically for us, since once that modular plug board is out, that gives us some extra room. 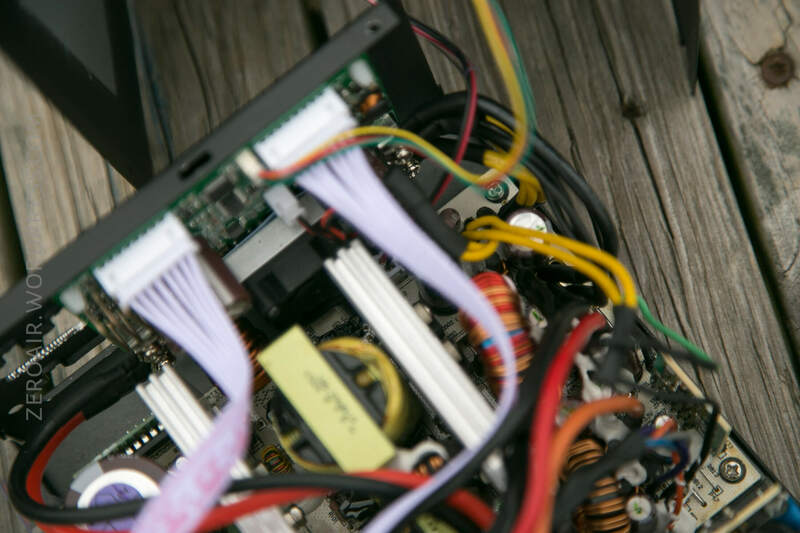 It’s ok to just clip all these wires free – we won’t be reusing this board. At around 0:45, you can see what we’ll put in it’s place. At 0:46, I point out a resistor that is important – this indicates whether you have the new version or the old version of this board. The old version was not safe – you can find videos about that yourself. But the new version (the one pictured) has an appropriate safety measure added, which I’m pointing to. Those little plastic standoffs, which are included with the 5020, will be used, but we have to modify them. At their stock height, they don’t allow for the 5020 to fit where we want it. My first run I actually sanded these things shorter by a few mm. This time (and in the video), I carefully sliced them with a razor blade. Much better. Finally, I show some fitment concerns. 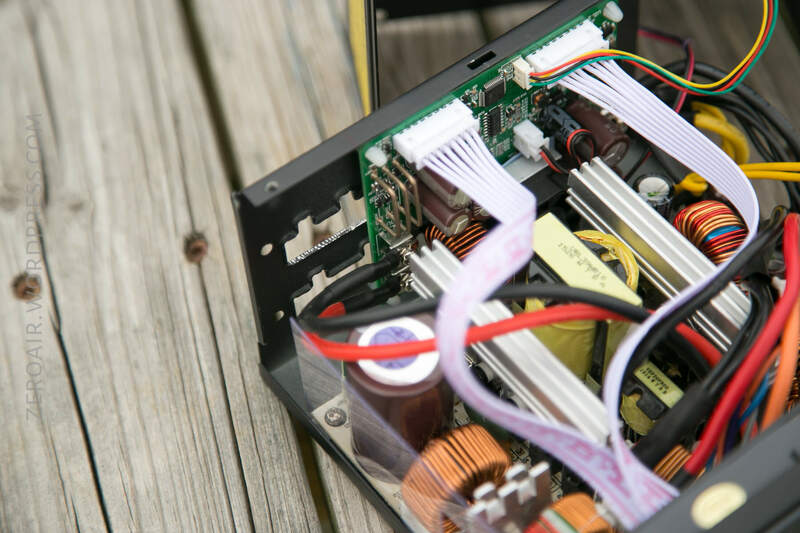 One, the large heatsink in the PSU – part of that will have to go. And also a tip for fitment – I’ve used a screw and some nuts to approximate my height, so I can test fit more easily. Time for some modification. The display unit of the 5020 is just a little too deep for what we need. I cut about 5mm off, all the way around the back. I used those fantastic clippers for this procedure. And on to probably the worst part of this job. Cutting a corner out of that heatsink. Ideally that whole thing could come out, and just be cut with a hacksaw. It’s connected to a bunch of mosfets, and I didn’t feel like dealing with taking them out. So I just covered the internals as good as I could, and did my best with a hacksaw within the case. Ultimately I did take the guts of the PSU out, but still left the AC voltage bits connected (so it was never fully free). Of course do your best to keep metal shavings out of the PSU! My advice is to cut more than you think you should. You really don’t want to have to cut this thing twice…. Some metal snips might work well in this scenario too – I just didn’t have any! There are some other non-trivial interest, however. The negative rails include -5V and -12V. Since we’re using an adjustable voltage setup anyway (the 5020), we won’t have to combine any of these negative and positive voltage to obtain non-(3.3/5/12)V’s. But it can be done. 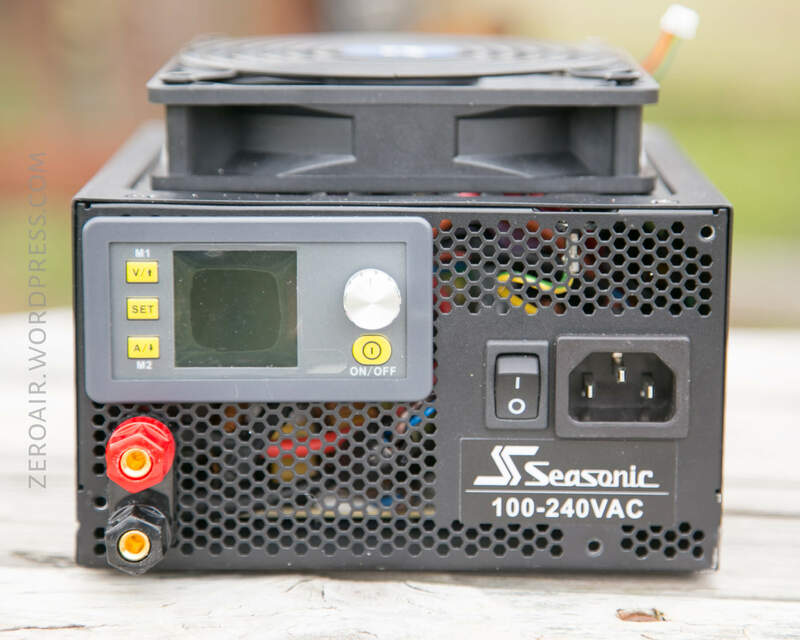 For example if we were to connect the 12V rail and the -12V rail, we could get 24V out of this PSU. However, the output current will be limited to the lesser of the two rails. In my case that’d be 0.8A. An order of magnitude lower than I want. So that’s a nonstarter. Even so, there are important wires to us. Notably the Green wire – we’ll cover more later but note that it’s the “PS-ON” wire. The PSU will not power on unless this green wire is connected to ground. And in fact, here’s me connecting the green and ground (black). I do solder them together, and so the PSU will now always turn on, without a computer connected. Normally (where “normal” is the PSU being used to power a computer), the computer will send a signal to the PSU over this line and say “it’s ok to start” and the PSU will start. There is probably a better way to do this connection, and if I build again I’ll do it this way. I’d wire a DC switch between green and black, and mount it to the front. Yes it’s duplicating switches, but it’s a nice backup. Of course that means one more hole in the front of the PSU, but it’s probably worth it. I’m marking the back of the PSU for the holes where the 5020 board will be mounted. I tapped the holes with a punch, then drilled small holes, then bigger holes. Since the 5020 board doesn’t leave much room for error, placement of these holes is critical. 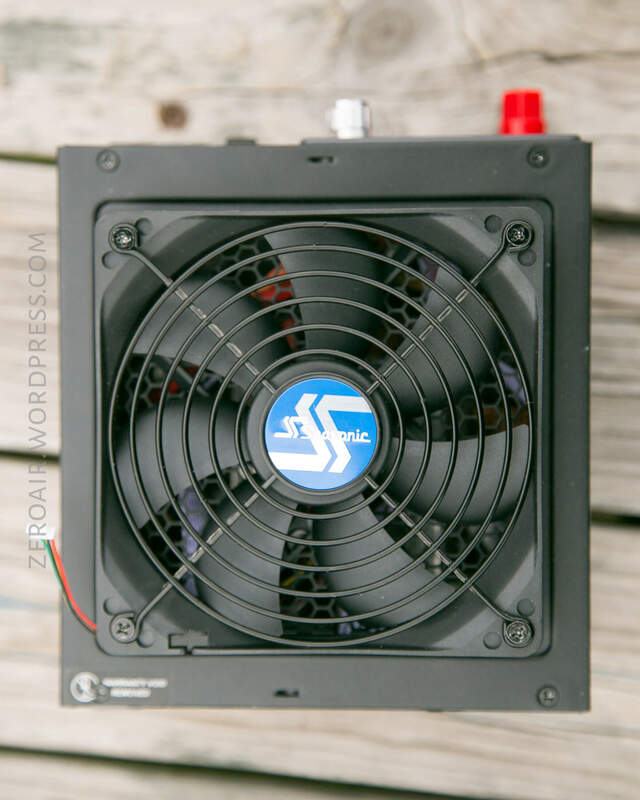 I toyed with the idea of adding a 5V fan (~80mm?) to the back of the case for three reasons. One, it’d be nice to have extra cooling. Two, it’s be nice to use a fan plus a nice grille, as a cover for all the holes I wanted to put in the back of this case. And three, I would run this by connecting power directly from the 5V rail. The fan would be on all the time, and has a low (but present) resistance. Some users report the need to add a resistor to the 5V rail in order to have smooth power. I didn’t test if I have smooth power but I haven’t had any issues without adding said resistor. You’ll have to connect the power off the 5020 board (in back) to the binding posts that you add in the front. I’ve used some silicone coated, 12ga wire, which I absolutely love. I used it inside the case (here) and also for my leads, of which I’ve made many. I use a spade connector on one end, and a ring crimp terminal on the other. The ring must be able to fit over the back of the binding post. Heat shrink everything! Also, and probably very important to note. The binding posts I am using here are not insulated. So the posts go through the metal case, but could conceivably touch the metal case, which would be a problem. I used a couple of nylon washers around the binding post, cut to just fit in the opening of the PSU honeycomb. There could be better ways, and I encourage you to explore those and let me know what you come up with. Once the binding posts are tightened down, I have fairly good confidence that these nylon washers will say in place, sandwiched between the plastics of the binding post. I hope this video wraps it all up! Right off the bat, I’m capping my 12V wires with some ring connectors (crimp and heat shrink!). Then (finally!!) dropping the 5020 board into it’s home, and connecting all the wires. Be aware of how the wires connect – in and out and such. Don’t…. do it backward or you’ll ruin all your hard work. Don’t over bend the 12V-in on the 5020 – this has been a problem (and was the main fault of the old units). 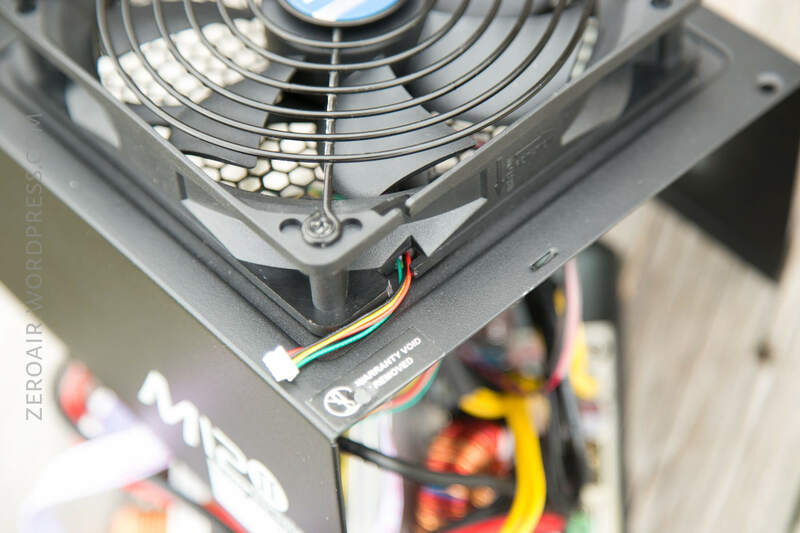 Be aware of where there might be heat in the PSU, and try to route your wires away from that. A note about the wires that connect the 5020 board to the 5020 display. These are flat ribbon cables, and can be subject to interference. My first build had the 5020 board flipped, and the way the cables routed went over something that caused huge electromagnetic interference. I solved this by buying a second set of these cables, connecting them with the arduino style connectors. This worked…. but not ideal. In this build, the orientation of the rear 5020 board naturally routed these cables away from the EMI, and so it wasn’t a problem. Because of this, I recommend testing EMI before you drill your first hole. And that wraps up the build! Don’t forget to connect your fan. 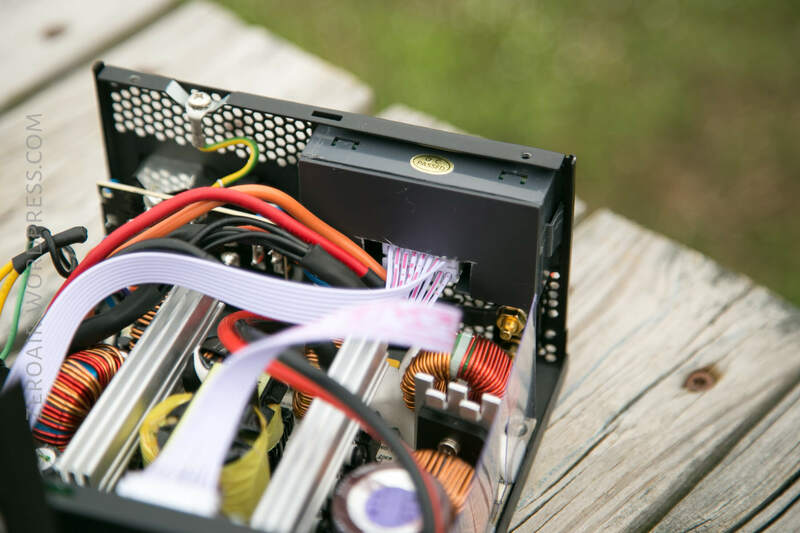 Speaking of fans, somewhere along the way, the 120mm fan of the PSU got moved to the outside of the case. This is as simple as just unscrewing it on one side, and moving it to the other. This also gives a good place to kick out the connectivity options of the 5020 – I have both bluetooth and microUSB. Unfortunately they can’t be connected at the same time, so take your pick. I’ll be honest – this isn’t a review of the RuiDeng 5020, which is essentially the UI of this device. I’ll summarize by saying that the UI is pretty good, and I have no trouble using it. I can run through the UI in another post if there’s interest. How to use the device (not just the software)? Well, start by plugging in some of the custom wires that I’ve made (which you can see below). Red is positive, and black is ground. Then I attach whichever tips are most useful for the application. When I’m testing low voltage protection (LVP) of a flashlight, for example, I’ll choose the spring tip tips. Then power the device on, set the voltage and current on the 5020, and turn it on. Then connect to positive and negative of the flashlight, and go through the modes. Note that the 5020 has memory slots, so I have a “single 18650” saved as 4.2V and ~10A (can go up to 20A, I just keep 10A for ‘safety’). There are a number of memory slots but I haven’t found the need to program more than a couple. I’ll add that there is at least one alternative firmware. It’s called OpenDPS. It looks great but I haven’t tried it. I don’t actually have the device for flashing firmware, and also, the native RuiDeng firmware is just fine for me. I might try flashing this other firmware, if I get the device, just to see what the OpenDPS is like. If I do, and there’s interest, I’ll report on that in another post. What would I change about this build? Well most of those changes have already been mentioned. I’ll try to summarize them here. I’d add a DC switch on the green 5V line, so that I can have that as a device shutoff. 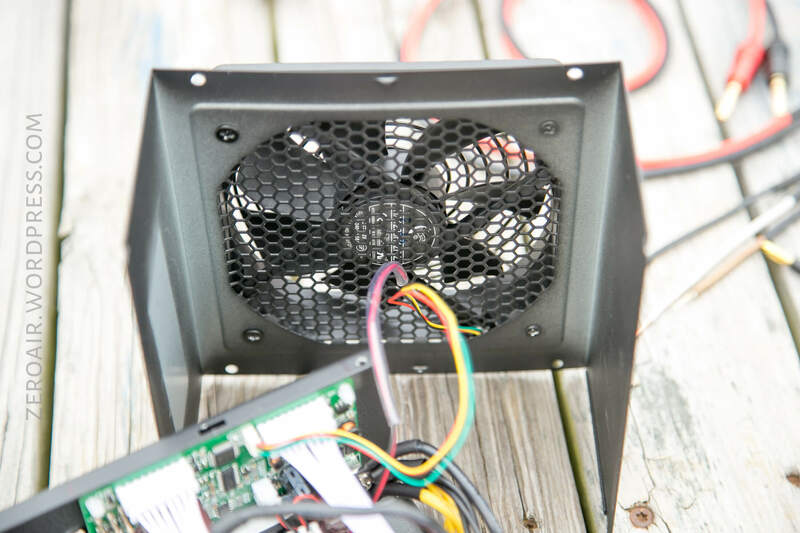 I’d really like to keep the 120mm fan inside the case, and I do think it could be done…. 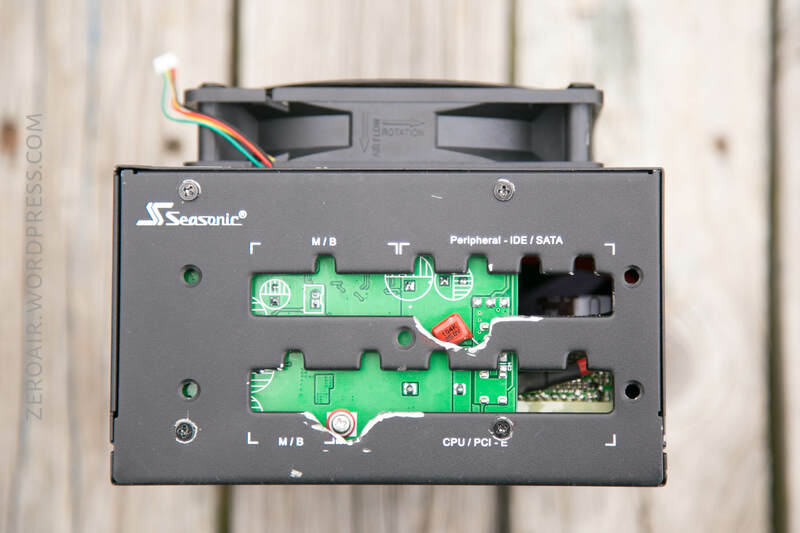 That would take some fan modification, though (the board of the 5020 just doesn’t allow the headroom for the fan). It would really be nice, after all this work, to have a device that goes over 11V output. There are such devices. 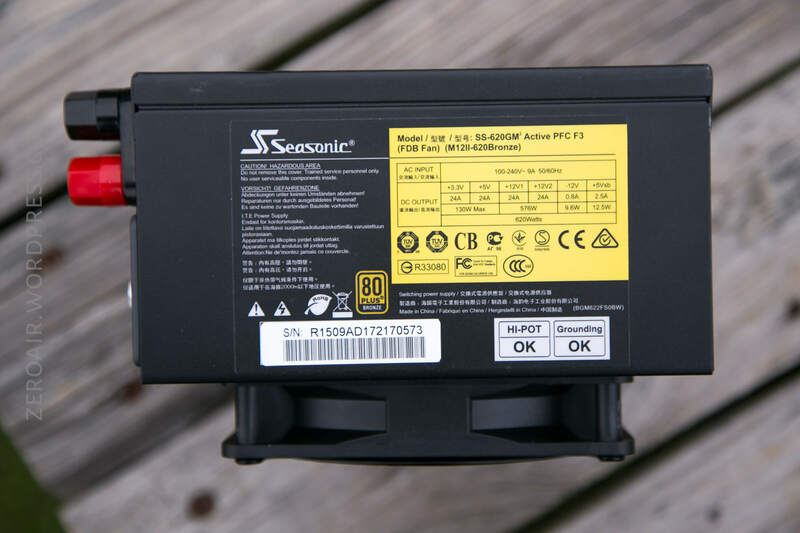 For example Golf Cart Chargers are ~50ish V and >20A, which would supply everything the 5020 can handle anyway. There are server power supplies at 48V which do the same. There are a number of options. The 5020 really does not have to be built into the PSU. There are boxes made by RuiDeng that fit this 5020 perfectly, and would make this whole setup just about as simple as connecting a few wires…. I can describe that build if anyone’s interested! You could use the boost version of the RuiDeng, the DPH3205. But you’re still limited to 32V max output (realistically less, I believe, with the 12V input). Also that maxes at 5A output. Realistically, >5A output was more important to me that >11V output, so that’s why I went with the 5020. Also there are versions like the DPS5005, which would be so much easier to install – it has only the display! So you could have 11V and 5A (not more), but controlled current and voltage. This could be a win for many users, to be sure. Also could likely be done without moving the fan to the outside of the case! 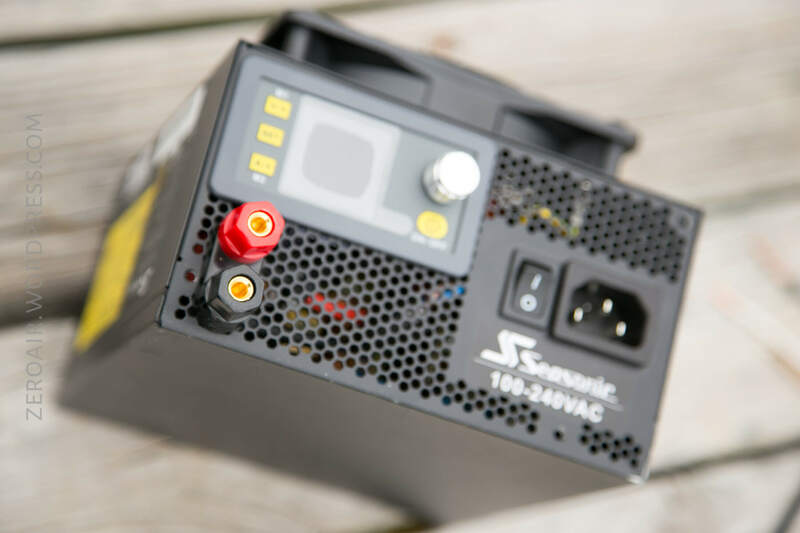 And would not use even half the 12V rails, which means you could maintain a fully working PSU. I’d love to have added some ports, like USB/microUSB, etc to the front of this case. At the moment that’s past my expertise (mounting them was the real issue). The would connect directly to 5V, and be plenty beefy for any amount of current you’d want. I did purchase a part for this, but never got to connecting it. On my teased build 6 months ago, I had four sets of binding posts. One was connected to the RuiDeng 5020 (and thus variable current and voltage). The other 3 were connected directly to 12V, 5V, and 3.3V. This meant I could always get those specific voltages without even using the 5020, at any time. I find that I absolutely do not use these, ever. So in my second build (this build), I left them off. I’m happy with that decision. Just note that either works well! Using the 14ga silicone wire, I made some leads. 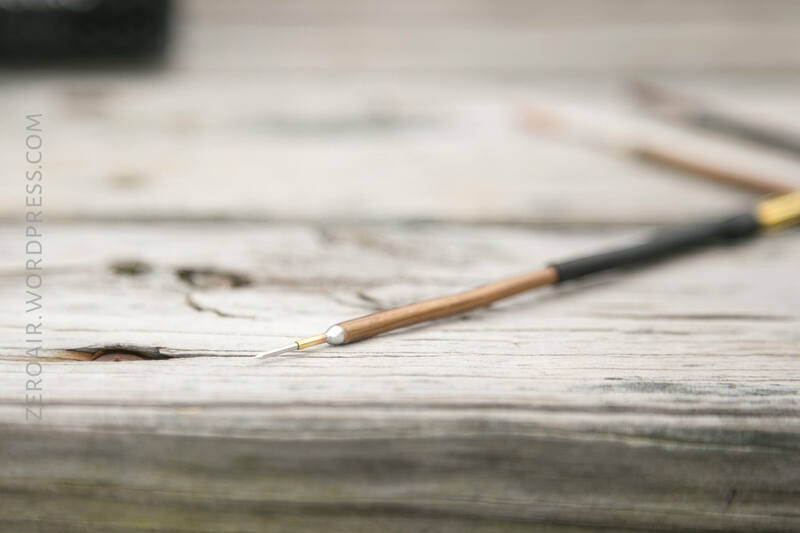 Not simply leads though – I made essentially extensions, and the option to connect a number of style tips. 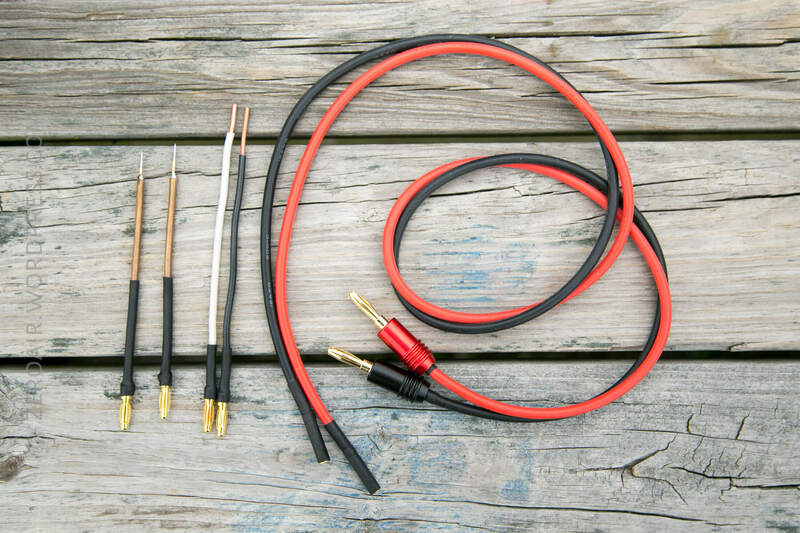 I only show two types below: Spring tip, and solid copper (wire). The spring tip is super nice. First off, they’re fairly sharp, so they get a nice bit of grip on flashlight parts. Secondly, they’re springy, which helps hold them on the target easier. I didn’t build-log these, but I’ll offer you (what I think is) a clever tip. Start with 1/8″ copper tube! The little brass tip (from Banggood) will fit right inside this copper tube. Solder these together and boom, done! The other end of these tips, and the extension wires, for that matter, require 4mm “bullet connectors.” I can not stress my love for these things enough. Buy 20, then buy 20 more. They allow one to build so many things, and they’re so cheap. The extensions have regular banana plugs on one end (which connect to the bench power), and the other end has the female side of the bullet connector. Having a bunch of tips, with male 4mm bullet plugs, instead of a bunch of whole wires with those tips is space-saving, cheaper, and much more convenient. I’ve since added a much beefier tip, which is 14ga solid copper wire (just like the others, but about 1/8″ thick copper! I rounded the tips to a broad point with the dremel. I also made an extension cable which terminates in alligator clips. This is a must. They’re so useful and convenient. This no-name power supply is going to be the most competitive option, though there are definitely others. This one is nice because the range is up to 30V and 10A. That’s a very nice range indeed! It’s a working bench power! I have flashlights in for review. I have RC cars in for review. I have some chargers in for review. I have a vacation coming up. Let’s be surprised together! Excellent write up, super informative! I especially like the addition of the timelapse videos, and as always, your pics are top-notch. Thanks for posting this build! Thanks! I’m not sure I’m done, either! Might have another build or two in me! Very cool build! I like the idea of the small form factor. How do you usually use this in flashlight testing? Is it mainly for battery charging? I actually don’t use this for charging at all! I’d need to add a diode to prevent reverse current back into the PSU. I’m not sure how to do that, and I don’t need this as a charger if I’m honest. What I use this for is testing the current used on each mode, and testing for low voltage protection. Since this post I’ve built two little probes with switches, so I can connect power and simulate the clicky switch (of mechanical switch lights, not e-switch lights). I’m still not getting it, how do you test the current when you’re the one applying the power? 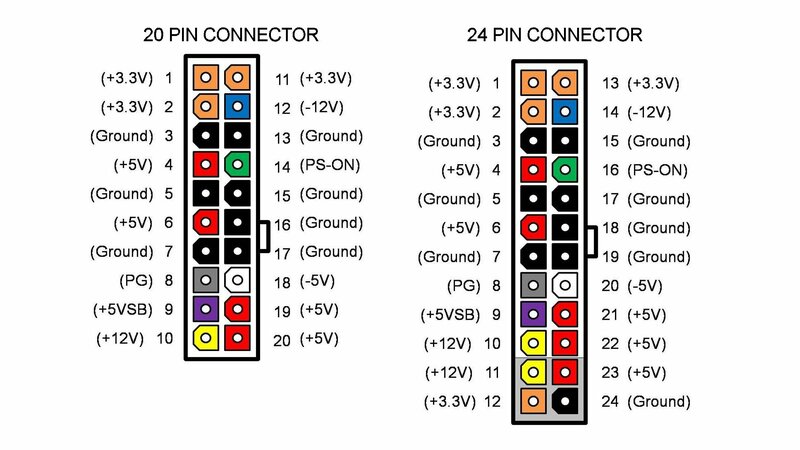 Does the power supply get set to 3.7V and then it automatically adapts to the current demanded by the light? Thanks! How about I do a video showing it? Maybe I’ll make a post soon with that info. Could be useful!